Runs on 0.5 HP single or Three phase AC induction motor. Recipient of an award from the Government of Gujarat. The challenges posed by the contamination of food grains, lentils and oil seeds with small stones, mud pellets and fine mud further exasperate the struggles of farmers. As a result they cannot reap a decent price from the yield despite the fact that it takes farmers years of labor and withstanding both the extreme weather conditions such as draught, floods from cyclones and pest problems to harvest a good crop. On the one hand small stones, mud pellets and fine mud pose a big problem, sorting the mixture of different varieties of grains grown in the same field is another time consuming costly affair for these farmers. Peter, Dinesh and Kiran are not only well trained engineers but they are also good friends. Mr. Peter, a Marine engineer reached an ashram in Pondicherry for treatment when he was debilitated by spinal cord injury after a decade of travel around the world as part of his employment on a ship. Once he recovered his health, he settled in India and has been helping for the past 22 years with programs dealing with tech stories of rural agriculture and livelihood. Currently he is working with Mr. Dinesh in Kadiri, Ananantapur district. 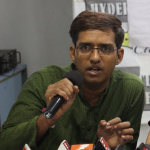 Mr. Dinesh was born in Mysore city of Karnataka. An Electronics and communications engineer by training, have been working with Gary of Anantapur district for past 26 years. He is in Kadiri and established the Social enterprise ‘Earth 360 ECO VENTURES’. 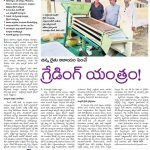 For the past 20 years he has been intensively working to revive millets crops and foods in Rayalaseema region. Telugu speaking Mr. Vissa Kiran returned to his native land to focus his efforts on the welfare of farmers, after living and working in the USA for several years following the completion of his engineering from IIT-ECEL in Madras/Chennai . The aim of these three friends is to support the small scale farmers who constitute almost 80% of the farming community in the country. These small scale farmers should not fall into the traps of debt or compelled to commit suicide. 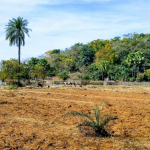 It is necessary that they grow and survive on native crops that are known to withstand the changes in their local climate using organic farming and stay away from growing non-native crops. They should be able to sell the remaining yield from the crop for a decent price. To achieve this it is essential that these farmers produce high quality crop devoid of impurities like small stones, mud pellets, silt or sticks with less effort and cost-effective means. However, they do not have access to portable, field level, efficient grading devices. There are huge mobile combined harvesters, these machines, are only available for farmers belonging to bigger farming associations and big-scale farmers. Consequently, the small and marginal farmers are left with no other option but to sell their crop to brokers for non remunerative price. Four years ago, these three friends decided to create a portable grading machine that not only effectively sort different varieties of grain and remove the contaminants such as mud pellets and silt but is also easily transported to the field to be able to address the aforementioned shortcoming faced by small farmers. They focused their complete attention on experimenting and researching at the “EARTH 360” processing unit in Kadiri. After consistent efforts achieved to bring out the device that they envisioned. For the past 8 months they have been improvising the device based on the feedback from local farmers to make it the final model with good features. This device effectively removes wide range of contaminants including small stones, mud balls sand, small sticks and even the unfilled seeds as per Peter, Dinesh and Kiran. This device is 4 feet wide, 6 feet long, 4 feet high and weighs 80 Kg with 4 grading decks. Operating on 0.5 HP single or three phase AC induction motor this device can be used with the power supply available in the most rural villages. It grades up to 1 tonne of grain per hour. In addition to sorting the common contaminants it efficiently removes different kinds of impurities in the grains to produce clean graded grains for marketing. 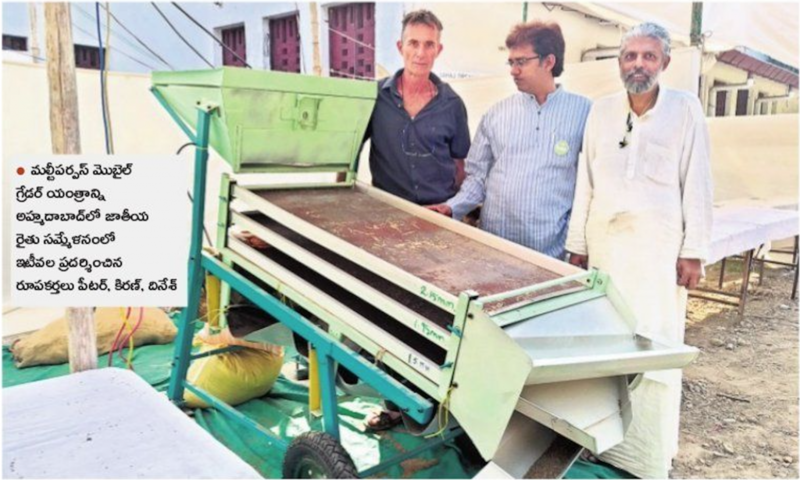 It has four sieves to the hopper and grading boat and a wheel at the front bottom so that this device can be transported to the fields and used right after harvesting the crops, as a trailer attachment to either a bullock cart or tractor. There are attempts being made to be able to run this device solely on solar energy. 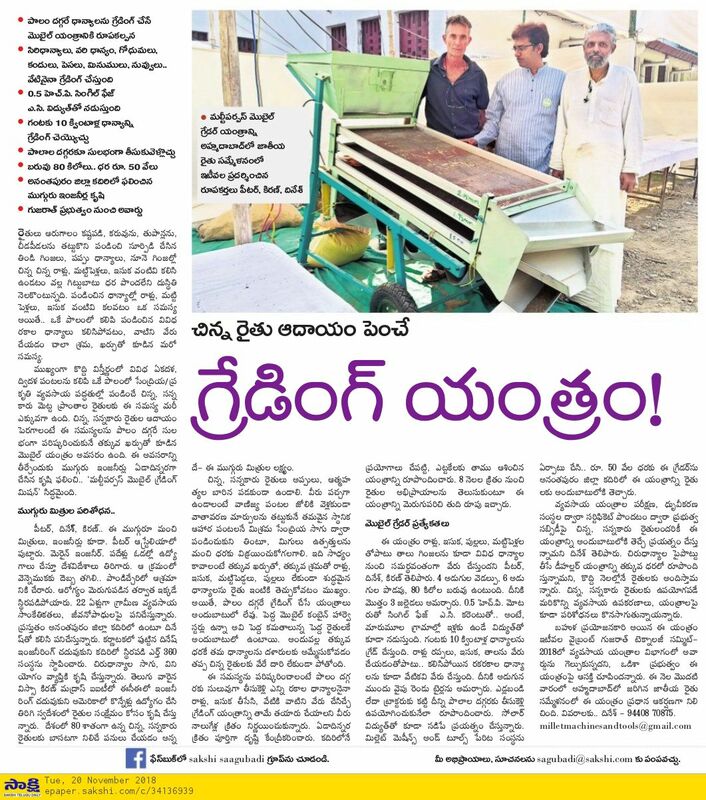 They established an enterprise “Millet Machines and Tools” and are making this device available to small scale farmers in Kadiri of Anantapur district at an affordable price of Rs. 50,000. Mr. Dinesh informed that they are attempting to get government subsidies by obtaining the certificate from the Agricultural machinery Inspection and validation organization so that the cost of the mobile grading machine is made more affordable for the small scale farmers. In addition to this they are in the process of developing the dehulling machine for millets and would make this available in a few months. Moreover they are continuing to research on additional such devices that would help the small scale farmers. This multipurpose device has earned an award in 2018 Vibrant Gujarat Technology Summit under the category of agricultural machinery blooming stage. They also said that the government of Orissa is expressing interest in this machine. This device was a primary attraction at the National Farmers Meeting held in Ahmedabad in the first week of this month.